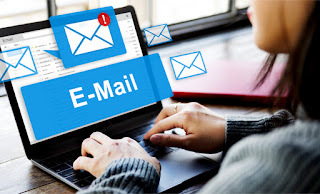 E-mail [Electronic mail] is an electronic message transmitted over internet/computer network from one user to another E-mail is a text based mail consisting of lines of text , and can include file attachments. These attachments could be pictures, documents, spreadsheets, audio files, video files etc. E-mail can be send to one or more than one person at the same time. The recipient of e-mail can open the e-mail at his/her convenience. Since messages are transmitted electrically over internet, it is a faster way to communicate with the people. Persons could be located in the same office, home, building, or anywhere in the world. E-mail messages can be send or received at any time and are typically send over a network (office network or more likely internet). If so desired, a copy of the e-mail message that the sender has sent can be saved in the sender's computer e-mail account for later reference. In addition to sending messages, e-mail is an ideal method for sending documents as attachments. E-mail has quite a few similarities as a regular postal service. A poster letter is send to a postal address.An e-mail is send to an e-mail address. E-mail address is much shorter. Just as in the case of a postal letter, the sender of e-mail composes the message and sends it to the e-mail address of the recipient. The postal letter is normally put by the postman in the letter box outside the house. Similarly an e-mail is received by the recipient in the inbox of the w-mail application. While postal letter travels from the sender's office to via the postal bus/ train/ air/ postman, the e-mail message travels electronically over the internet and computer network.